Dudley Crescent is a verdant parcel of land in London, granted by King Charles II to the Earl of Dudley who was one of his staunchest supporters. With gold he’d stolen as a highwayman during Charles’s exile on the Continent, Dudley put his ill-gotten gains to good use and built the finest town homes in the capital. Renting the land in perpetuity to certain Royalist friends quadrupled his fortune. Today, those who have townhomes surrounding the verdant park are a few of the wealthiest and most influential lords and ladies in the kingdom. For example, as No. 10 lives lonely, lovely Alicia Blindon. She's a widow, you see, with a devilish problem. She likes her butler...more than is proper. At Number 18, Baldwin Summers, the Earl of Cartwell, deals with three problems in his house. At thirty-six, he has decided to give up his two mistresses. They’re lovely women, really, but he’s very bored. He’s tired of gambling as well. He’s won land and houses and fortunes far too often, and to be frank, the thrill is gone. He’s enticed now by the lure of managing them. Recently he’s had thrust upon him quite suddenly his cousin’s eight-year-old daughter. The child is a terror and needs a firm hand. With no idea how to mold her into a socially acceptable creature, he hires a governess. However, that woman presents his most pressing problem. She mesmerizes his ward. But she’s enchanting him. And it’s a wonder because she is so very lively, lovely—and odd. She recites Latin like Cicero, defeats him every time at chess—and dances. Nightly. In his drawing room. Alone. He cannot ignore her. He cannot control her. Worse, he cannot quell his mad desire to kiss her. But can he offend the ton and do what he really wants? 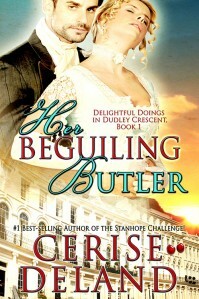 Can make her more than his governess? And would such a bluestocking deign to become his countess?